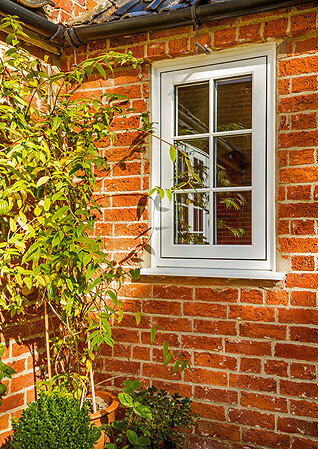 Flush casement windows from New Leaf are available in solid wood and also in timber-alternative construction. Our timber windows use wood from properly managed forests that is specially selected for its fine grain and high quality. Craftsman-built with durability, security and beauty as the core qualities, our flush casement windows are individually crafted to your exact specifications. No matter how unusual the size or design, we can meet your requirements. All our wood windows are supplied with the option of bare timber, or factory paint or stain finishes, the latter with the benefit of micro-porous sealant, primers and top coats. There is an almost unlimited choice of colours and this finish provides long-lasting weather protection and elasticity, eliminating the risk of distortion that can occur with other products. The non-timber windows we supply are of extremely high quality. Incorporating advanced features, such as seamless-welded joints, they are available in an extensive range of colours and wood-effect finishes. Together with the wide range of styles available, they are equally suited to traditional and contemporary homes. The design of these products ensures excellent thermal efficiency and weather resistance, so they not only look stunning, but perform perfectly as well. Timber and timber-alternative windows can be supplied with a wide range of lock systems and hardware. For the ultimate in security, some of our timber-alternative windows are available fitted with laminated glass, enabling them to achieve the police approved 'Secured by Design' standard.